The Walden Wood Project’s new website. 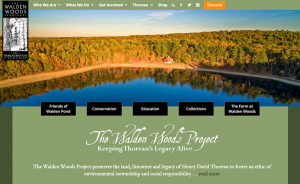 We launched The Walden Woods Project’s new website today. Their prior site had a nice historical feel and a lot of useful content. It was showing its age though with a dependency on Flash for the home page, search tools that weren’t working and no friendliness for mobile devices. The new site balances a more modern look with historic elements. It adds a sophisticated system for managing and presenting the many works in their collection of content by, and about, Henry David Thoreau. It works on mobile devices, has useful search facilities and much easier tools for donations and their online store. The site features beautiful imagery from Walden Pond and the surrounding area and a video introduction by Don Henley, founder of The Eagles and The Walden Woods Project. The Walden Woods Staff put many hours of work into updating, refining, organizing and creating content for this new site. Our part was creating the home and tools for experiencing their content. Visit the site to see what we created together!